Bavarian German Culture during the Maibaum Festival in Germany. In Putzbrunn, which is south of Munich in the heart of Bavaria, traditions are still very much observed at least May 1st celebrations. 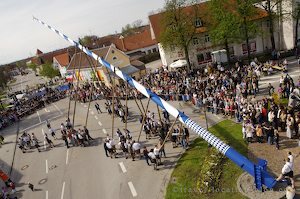 The Maibaum festival is translated in english to the raising of the May Tree. It’s a day which draws locals and neighbouring communities together for a day of celebration of traditions (this includes very heavy beer drinking). At Putzbrunn, the town’s 34 metre tree was raised not by crane but by pure brute strength.